Home > IIM_CAT > Resource > Thoughts > IIM - CAT 2014 - What's New In this Edition of the Exam? 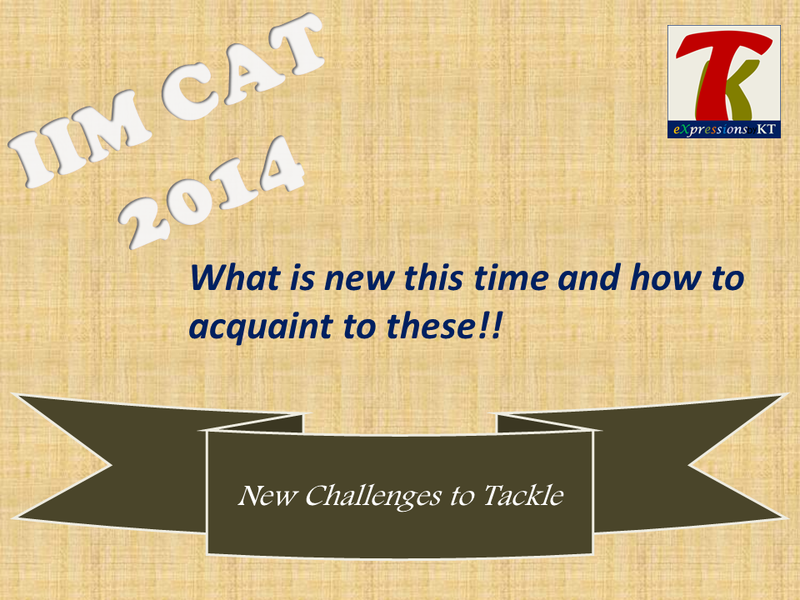 IIM - CAT 2014 - What's New In this Edition of the Exam? Common Admission Test (CAT) conducted by Indian Institutes of Management (IIMs) is an ever evolving exam and IIMs try to play around with the format of the exam in almost each of its version. This one is no different and some key changes are apparent in the pattern of paper as provided in the advertisement. So here is a primer on what these changes are and what do they mean for the candidates. Flexibility - Permission for deciding on amount of time to be given to each section according to candidate’s ability and to switch over from one section to another section for the duration of the examination. Limited Sessions – Unlike last CAT where examination was conducted over 40 sessions, this time IIMs have kept only 4 sessions over two days (consecutive weekends). It is important for the candidates to assess the impact of these changes on the examination and suitably tweak their preparations to incorporate these changes. Now, first thing that candidate should know is there is no change in the syllabus or content of the examination as such and hence they can continue their preparations using the same strategy which they are following. However, these changes make it necessary for candidates to bring in some tactical modification to the preparations so that the changes in examination pattern could be used to their advantage. I would consider following aspects to be important from point of view of preparations based on the new patter. Time Management Gains Importance – Though CAT would now have more time but the drastic increase in number of questions means that candidates would have less time per question. To be specific the time per question allowed has come down from 2.33 minutes to 1.7 minutes which is a considerable reduction by over half a minute. One may thus infer that IIMs are planning to bring down the level or toughness of the questions atleast marginally to allow for this change. This would mean that more number of candidates would find it easier to solve the paper and only key differentiator among those would be the speed. Hence, managing to solve the maximum number of questions within the given 170 minutes becomes more critical. Knowing Strengths and Weaknesses – IIMs this time are throwing in a double edged sword at the candidates by allowing them to shift between sections. While on first glance this may seem as a deserving right, it also brings in a challenge to utilize this right judiciously and effectively. One should be conscious of this during the preparations and should develop an understanding of his/her strengths and weakness so that decision to switch the section can be taken in right nick of time. Moreover this also makes it necessary for candidates to be able to judge on which questions to pick and which to leave. This would help them to avoid sticking to one section for majority of time and leaving out on scoring with some easier ones in the other section. Longer Sitting needs More Practice – CAT this time would require candidates to sit through an extra 30 minutes of examination. Realizing that it is a critical step in one’s career, the examination day is a high pressure moment and handling an additional half an hour is not going to be an easier task. Moreover, it is not just sitting down but to be at highest possible level of alertness and to minimize need for breaks within the examination. This ability needs to be developed gradually over time and would need practice through the preparations stage. Taking mock tests has become more important because of these changes. All the three aspects covered above can only be achieved by practice. Mocks need to be undertaken in actual exam like environment and it is critical to simulate these conditions. In case you are a student in campus, I would strongly recommend using library for these sittings. Hostel rooms are prone to varied nature of disruptions and disturbances which may not be conducive to the objective of you mock sitting. Even if you are at home or shared accommodation, inform your family/ friends about your sitting and request them to not disturb you during the mock of course unless the place is on fire. So brace yourself and continue your preparations in full vigor. Prepare well and Stay Motivated. Good Luck with the rigors!! And do not forget to register for the exam by September 30th! !